Facing Budget Gap, Colorado City Shuts Off Lights Colorado Springs, Colo., is turning off a third of its streetlights and slashing budgets for parks, police and firefighters, but that hasn't stopped voters from tightening the purse strings even more. 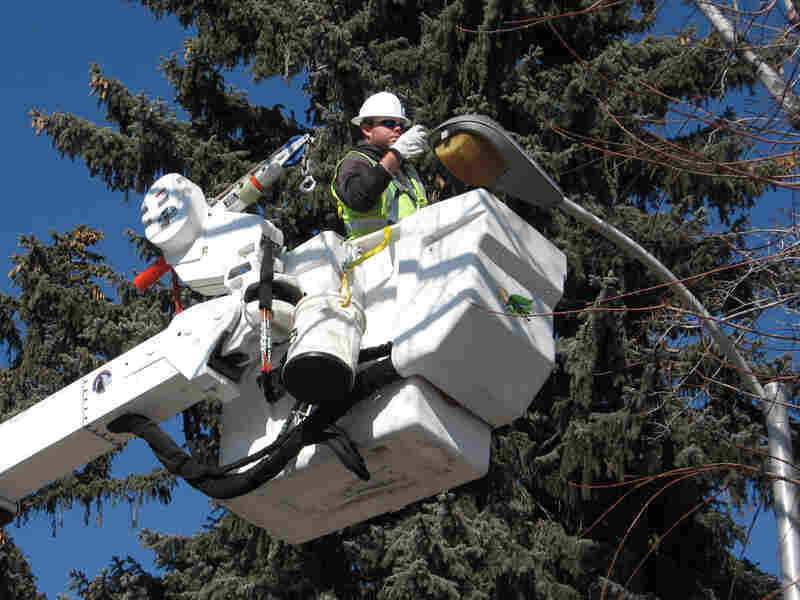 Troy Dalton of Colorado Springs Utilities disconnects a streetlight. The city estimates it will save over $1.2 million a year by turning off a third of the lights, but it's not enough to cover a $28 million budget gap for 2010. Like many cities across the nation, Colorado Springs, Colo., is trying to close a big budget gap. The town is shutting off lights and slashing budgets for parks, police and firefighters, but that hasn't stopped voters from tightening the purse strings even more. Most cities depend on sales taxes for revenue, and Americans just aren't spending like they were a few years back. Across the country, cities will have to fill budget gaps totaling up to $83 billion through 2012, according to the National League of Cities. As a cost-saving measure, Colorado Springs is turning off streetlights. Flipping the switch on about 1/3 of the city's 24,512 streetlights is expected to save $1.245 million in electricity. But that's just a down payment on a $28 million budget gap for 2010. "We've taken all the trash cans out. We're not going to be doing any litter collections in the parks," says Larry Small, vice mayor for Colorado Springs. "We're hoping the citizens will pack it out themselves." All the restrooms have been closed. There'll be very little watering, and crews will mow just once a month instead of weekly. The city even trimmed its police and fire budgets and is auctioning three of its police helicopters on the Internet. Still, that's not enough. "We did have a transit system," Small says. "That's gone almost completely now." The city sold nine buses and will use the proceeds to pay operating costs this year. On Jan. 1, 2010, buses stopped running on evenings and weekends. Resident Don Miller is leaving. "My lease is up in November, so I'm going to get away from here," he says. "I don't drive — I ride the bus, and there's no bus service on Saturdays and Sundays." In this politically conservative city, most people on the street say the city just needs to spend its money more wisely. "Seems like the city ... is overpaying its workers," Shirlee Kelley says. "I think the salaries have to come down to be more even with what the private sector is paying." Small argues that wages are comparable to other municipalities. But that doesn't satisfy critics, who don't like the cuts the city is choosing to make. "The government is using its typical tactic of making highly publicized cuts in order to make people feel the pain to some extent," says Douglas Bruce, a small government activist and author of Colorado's Taxpayer Bill of Rights. If that's truly the strategy, it's not working. In November, Colorado Springs voters approved an initiative sponsored by Bruce that keeps the city from raising property taxes — whittling away city finances even more. Colorado Springs is now considering wholesale changes to the way it operates. City leaders are thinking about selling the local utilities and a hospital. That could raise an estimated $1.3 billion. Small says the money could be put in a trust for the city and provide $50 million a year in much-needed revenue to pay for basic services.